A new vacuum lifter that is designed to fully support, lift, and power-tilt long, narrow loads in manufacturing process and shipping environments is being introduced by ANVER Corporation of Hudson, Massachusetts. The ANVER ETL Series Vacuum Lifter for long, narrow loads features high heat rectangular silicone pads that fully support a product that needs to be assembled, painted, or processed without marking the surface. 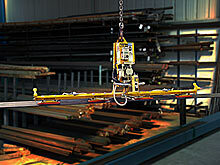 Allowing one person to safely handle these awkward and lengthy loads, this lifter has an electric power tilting mechanism and fully integrated operator controls. 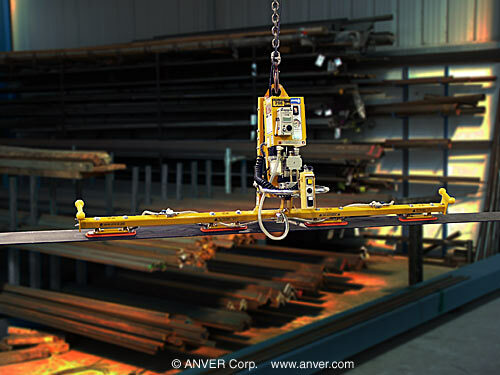 Providing standard attach and release with a locking slide valve and an up/down pendant, the ANVER ETL Series Vacuum Lifter for long, narrow loads has the ability to lock-in-place at any position from zero to 90 degrees. Powered by an electric vacuum pump, below-the-hook compressed air powered versions are also offered. Standard capacities range from 250 to 2000 lbs.